Somehow I seem to have caught a cold in the middle of summer. It's either a cold or allergies, I can't tell... I'm sniffly and my eyes won't stop watering. Haven't really felt super awesome for the past few days. And when I'm sick I rarely feel like putting much energy into my makeup, so here's a few of my lazy sick looks from this week! Stila Jewel Palette- brown shade, or purple shade? 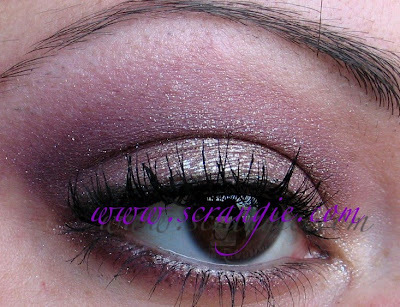 I thought it was brown but it really looks purple this time... whatever color it is, it's in the crease and lower lashline. 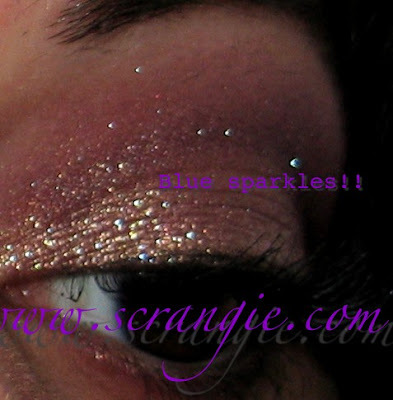 See the blue sparkles? Sadly, Aromaleigh is closing in less than a week so you might want to order it now if it interests you at all! 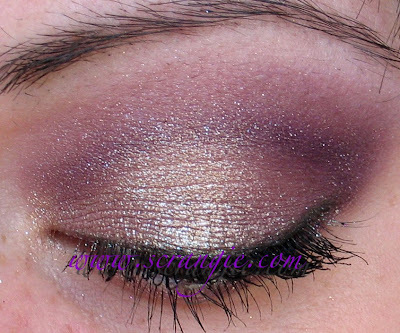 And the Stila Jewel palette shade is perfect for minimal makeup days for me. 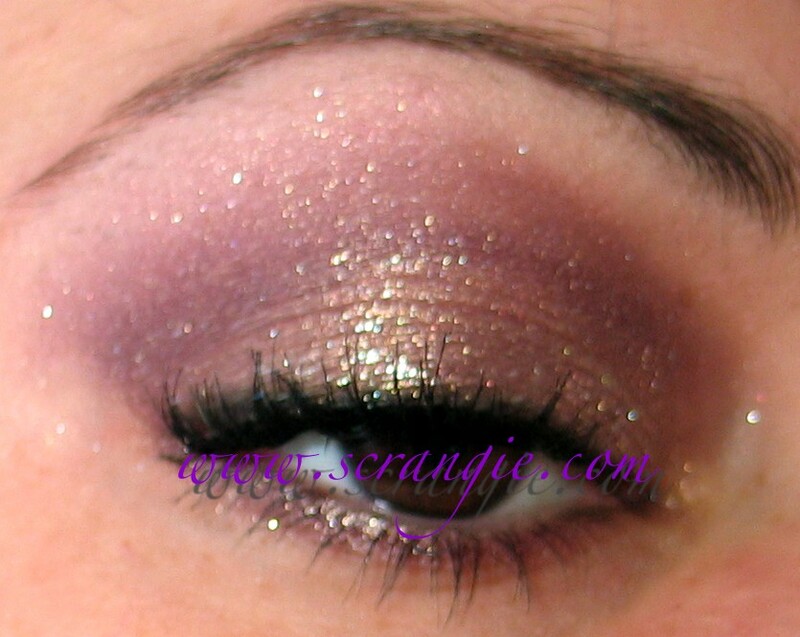 It has all the sparkle I crave but none of the effort of applying multiple shades and separate glitter. I freaking love that palette. Did I tell you I bought two backups of that palette? Eep. I know. But it's SO AWESOME. 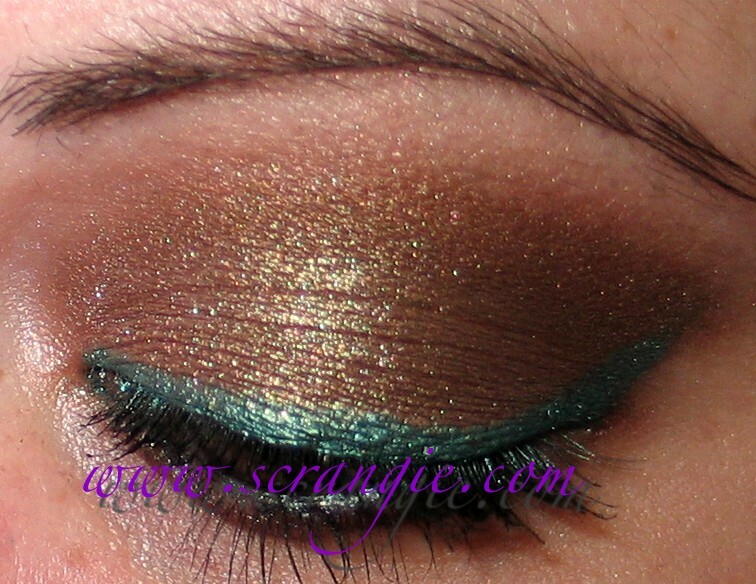 Greenman's Forest is a really sweet duochrome. It's light brown and a little goldish brown and a little green. I don't think I did a very good job of capturing the color shift, but hey, I'm sick, give me a break! 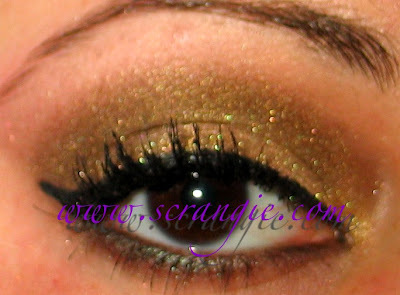 :P MAC Go is one of those amazing Starflash finish shadows so it's totally buttery and effortless to blend. Starflash was amazing, I really hope they do more of them. I don't think I have them all, I have most I think, butI wish I had gotten the whole set! 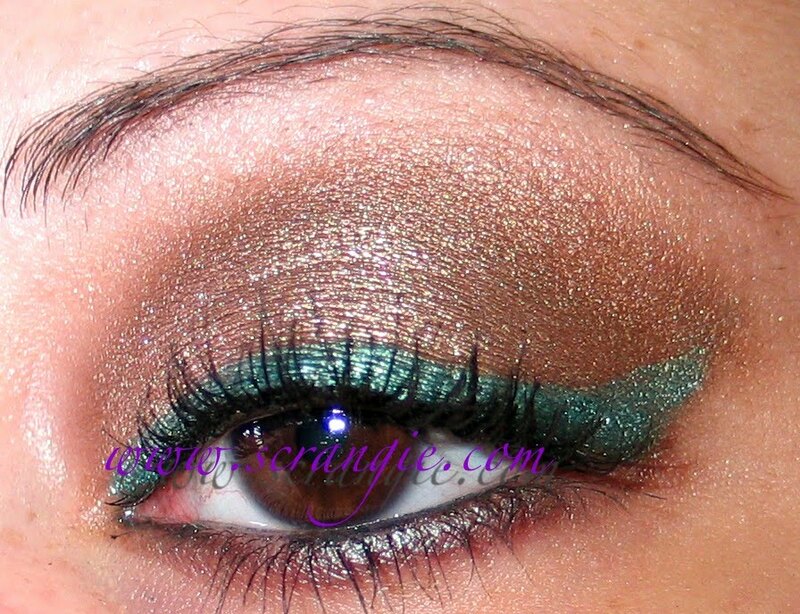 And of course MAC Teal is the perfect eyeliner for brown eyed girls like myself. This one I didn't get any daylight pictures of so flash will have to do. You can see the sparkles better with flash anyway. This was actually a cover-up job! 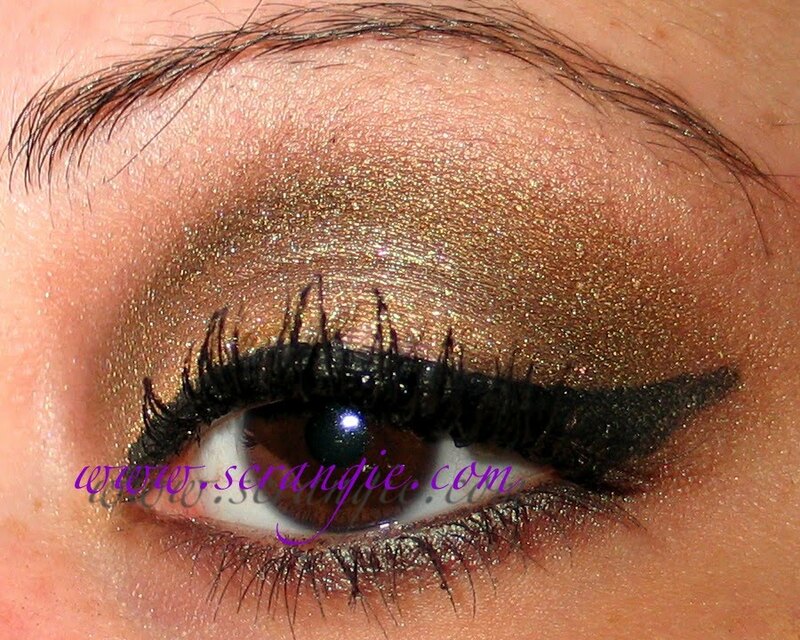 I did one look, realized I didn't like it and immediately covered it up with different colors! Oberon is another duochrome shade... Can you tell I love duochromes? I do. A lot. I took a blurry picture to show the sparkles of green against the taupey brown base: Blurry pictures show glitter really well. 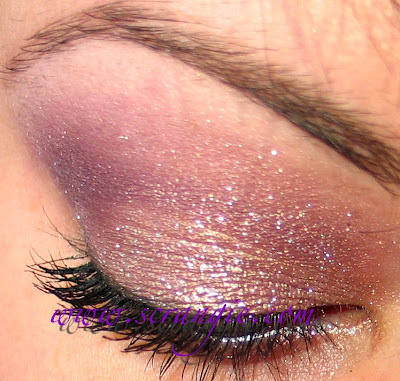 Though this isn't really glitter... it's just smooth shimmer in different colors, no flaky particles that are a different texture like real glitter is. Ambre is also pretty cool... I used it again yesterday. It's a little tricky to work with but if I layer it I have good luck. 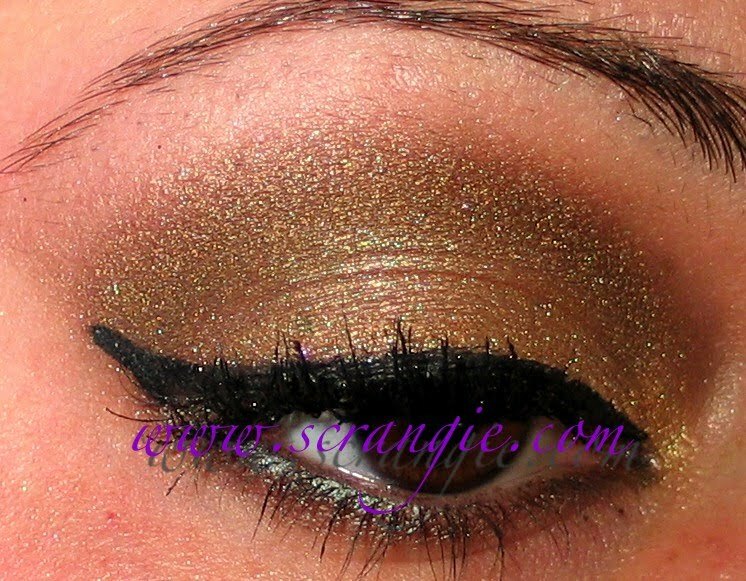 It's a really rich smoky looking metallic gold... a little dark... gold shimmer on a smoky base. I'll post that look soon. I've had a couple people ask me what brushes I use, so I'm going to attempt to remember to take a picture of them. My staples are MAC 219, 209SE (I like the SE way better than the normal one), Studio Gear #37 liner (I don't think they make this anymore, It's over 10 years old! ), Smashbox 30, something-20 dual ended (the numbers have worn off but I can not live without this brush) and Sephora brand smudge. Now I'm going to go make some of that awesome Traditional Medicinals Throat Coat tea... that stuff rocks. Way better than Yogi's throat tea. Random. But yay tea! Aromaleigh is closing? Why? I love this tinted lip balm I have of theirs..
Wow. When I am sick the LAST thing I want to do is my make up. Get well soon, Scrangie! lol, you put more effort into your "lazy sick looks" than I put into my makeup when i'm well! These are absolutely gorgeous! Wow, if that's what you do when you're not feeling well, then you must do amazing work when you feel great. Those eye looks are beautiful. Then again, you have beautiful eyes! Love the first look! I'm on a glitter kick lately :) I hope you're feeling better soon! I love your idea of "minimal" make-up - still ultra-glam! Hope you feel better...I really like these looks! I hope you feel better soon. I wouldn't call you lazy. You've put more effort into your makeup than I would if I were sick. Your "lazy sick looks" are better than my healthy as a horse looks.